Melt butter in a saute pan over medium heat. Add honey, vinegar and wine and bring mixture to a boil; boil for 1 minute. Add figs into the honey mixture and stir to coat. Arrange figs on a shallow baking sheet and bake for 5 minutes in preheated oven. Remove from the oven and allow to cool until figs can be handled. 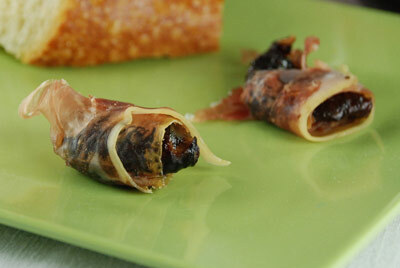 Wrap a strip of prosciutto around each fig section and place on a serving tray. Drizzle with more honey if desired.